I started playing guitar at the age of 15 and continued in lessons until graduating with honours from the Humber College Jazz Performance programme in Toronto, Ontario at the age of 20. While playing in Country and Top 40 bands I took the time to study with session guitarist Mike Francis and jazz guitar great Lorne Lofsky. One of my most memorable band experiences was playing gigs alongside fiddler Don Reed. I remember practicing late into the night before gigs knowing that I had to play with such an incredible musician. Playing with Don was a highly influential experience. I also started playing on small studio sessions while in that band and I have a lot of people to thank for their patience with me while I honed my chops. 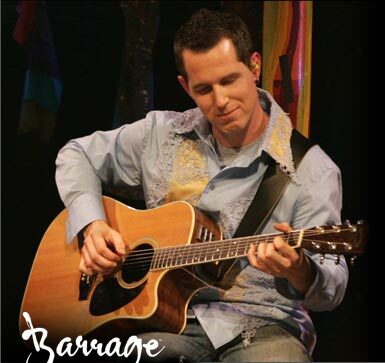 Before joining Barrage I toured with Shania Twin, a tribute to Shania Twain which was a fantastic time. My huge guitar influences are Brent Mason, Ray Flack, Lorne Lofsky, Daniel Lanois, Russ Broom and Bill Dillon. I’ll buy anything that they’re playing on. The records that I can’t stop listening to are U2’s Unforgettable Fire, Daniel Lanois The Beauty of Wynona, David Grey’s White Ladder and Emmy Lou Harris’ Wrecking Ball. Working with Barrage is an incredible opportunity and I’m so proud to be a part of such a great show.